Berliner Architects recently completed construction on a new middle and high school for Alliance Public Schools on First Street in East Los Angeles. The design of the project was driven by the desire to reinforce, invigorate, and revitalize the surrounding community. The two schools making up the First Street Campus are: Morgan McKinzie HS and College Ready Middle Academy 8. For years the site had been home to the First Street Store, a department store that played an important role on this street, which is lined with two story buildings with storefront retail on the first floor and apartments above. The store is unique in that its façade contains 17 tile murals (5’x11’) depicting the Chicano history of this largely Hispanic community. The former owner of the store commissioned local Chicano artist Johnny D. Gonzales to create the murals, titled "The Story of Our Struggle," in 1974. There is also a large mural containing the initials of the store: F.S.S. Berliner Architects wanted to preserve the murals, which were featured in LACMA's exhibition "Found in Translation: Design in California and Mexico 1915-1985," and used them as inspiration for the design of the school, mirroring the murals' arches throughout the architecture of the buildings. 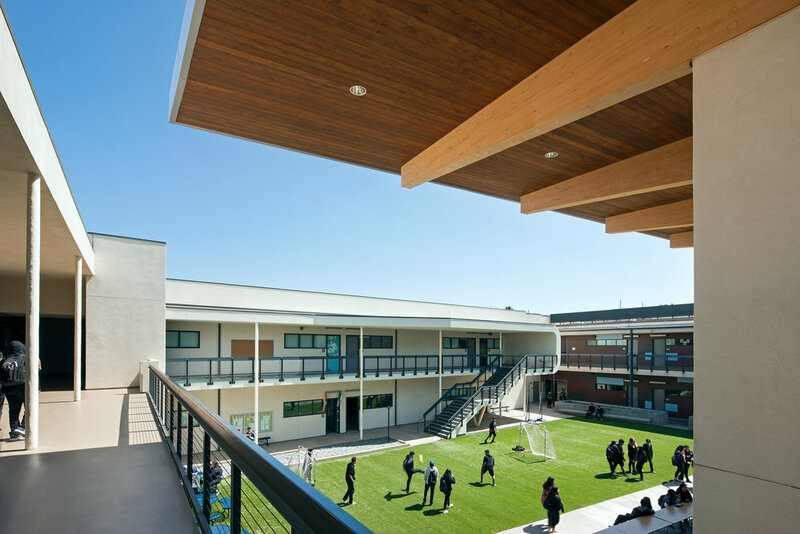 The design intent of the project, in which the two-story schools containing exterior balconies ring a large courtyard, was two-fold. The project, through its scale, mass, material, and fenestration, reinforces and enhances the existing street, while simultaneously establishing something of an oasis, removed from the noise, heat, and distractions of the street for the students within the courtyard. There is a multi-purpose room, to be shared by both schools, at the south edge of the courtyard, framed by the bar buildings running around the other three sides, and marking the entrance to the high school for the students and parents coming from the drop-off and parking area. The multi-purpose room functions as the signature piece of the project, and because it doesn’t need to mind the urban edges in the same way as the other buildings, its form and geometry are purposefully more playful. The multi-purpose room’s north façade, facing the courtyard, is composed entirely of storefront with large folding doors allowing student events and community gatherings to spill out into the courtyard, protected by the large cantilevered roof 30 feet above. BA believes that color plays an important role in the design of exciting and effective schools. In this project, the exterior of the buildings are clad in a lively, tri-color running bond pattern of cementitious siding, which works to activate the courtyard, while invigorating the public façade and giving the street an aesthetic shot in the arm.